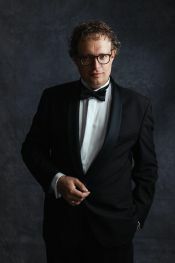 Over the past few years, Teun Michiels has managed to successfully profile himself as a thoroughbred oratorio tenor. His colourful Tenore di grazia voice gracefully sculpts every musical part with the utmost respect for authentic performance practice. He has collaborated with a variety of orchestras and ensembles such as l’Orchestre Royal de Chambre de Wallonie, Die Bergische Symphoniker (Germany), Euterpe Baroque Consort, Aspetti Musicali, Kamerorkest Arc-en-ciel, het Mechels Kamerorkest, Piacevole, Choeur Symphonique de Liège, Schola Cantorum Cantate Domino and The Royal Choir Society Mastreechter Staar. After obtaining his Bachelor’s degree from the Liège Conservatoire and his Master of Music from the Maastricht Conservatoire, Teun continued his musical education with Bart De Kegel as vocal coach. Surrounded since childhood by a family of teachers, education has always been a mainstay in Teun’s life. He is addicted to lifting students up to a level higher than their own expectations. Since 2006 he is a voice teacher at the Academie voor Muziek, Woord en Dans of Heist-op-den-Berg. Both his academic and private teaching are of great importance to Teun and many of his students and alumni have found their way to the professional circuit. Teun is often asked to partake in juries for competitions, entrance and public exams and festivals (e.g. European Musicfestival for Young People, Belfius Classics, …). For Teun this discipline constitutes a vital part within the educational field. Teun has graduated with great distinction from the Royal Carillon School “Jef Denyn” in Mechelen (Belgium). He was appointed city carillonneur by the town of Diest in 2005. Today he is still the youngest musician to have been awarded this post in Belgium. Together with the City Council of Diest, Teun organizes the International Carillon Festival as artistic director, which celebrates its 8th anniversary this year. He has been invited all over the world (Scandinavia, Portugal, Spain, the Netherlands, France, USA, Russia …) to play carillon recitals.